Welcome to the latest edition of Muscle Car Milestones. Here, we look at not just cars, but trucks, SUV’s, and any other vehicle that has become legendary, notorious, and maybe even loathed in the muscle car world. We will also take a look at the rare, forgotten, and just plain overlooked muscle from all eras. There are no rules or limitations on what we will cover. 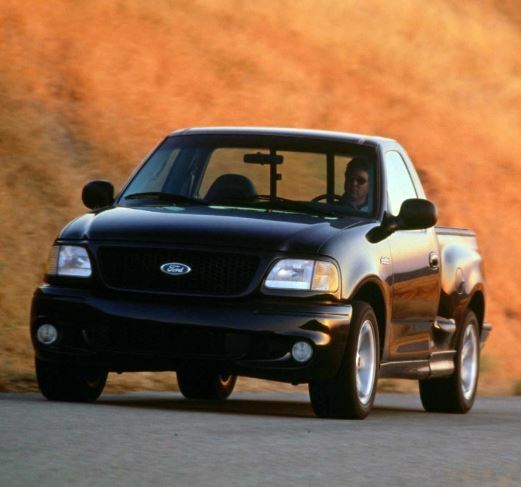 This edition of the Muscle Car Milestones highlights the 1993-1995 and 1999–2004 Ford F-150 SVT Lightning. In 1992, General Motors dominated the sport truck and SUV market with the Silverado 454 SS and GMC Typhoon. So what do you do when your nemesis has a foothold on the segment? You create a Lightning storm of your own. 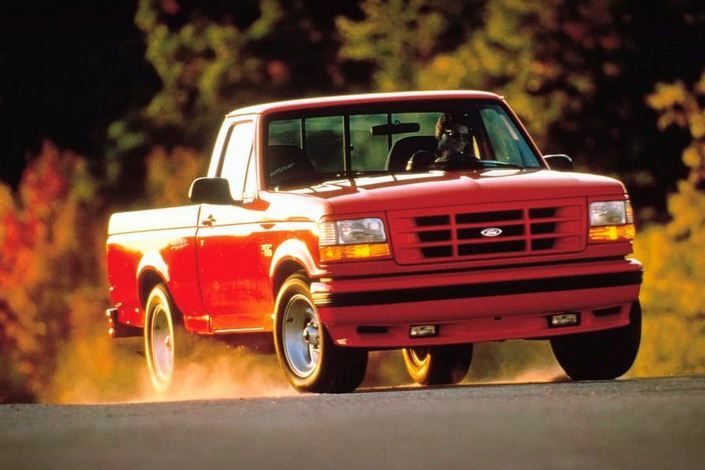 In 1993, Ford introduces the F-150 SVT Lightning. Ford unleashed the Lightning at the Chicago Auto Show in 1992. It later went on sale in February 1993. 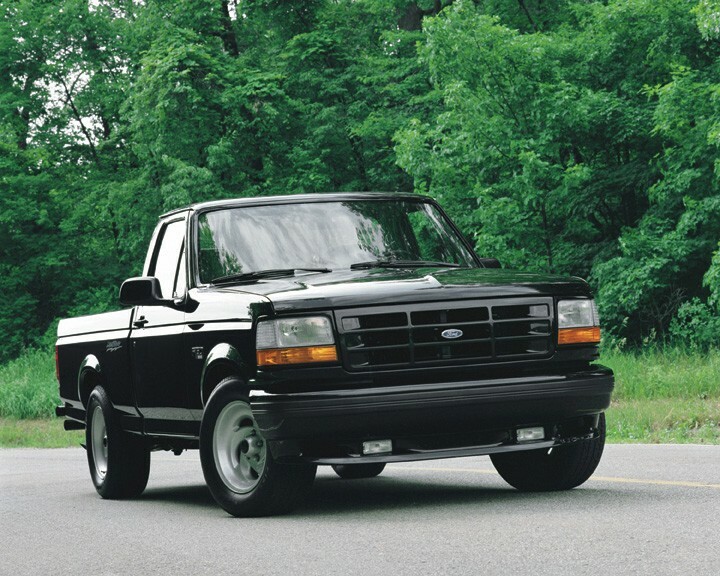 Initially available in red and black, Ford added white to the color palette in 1994. 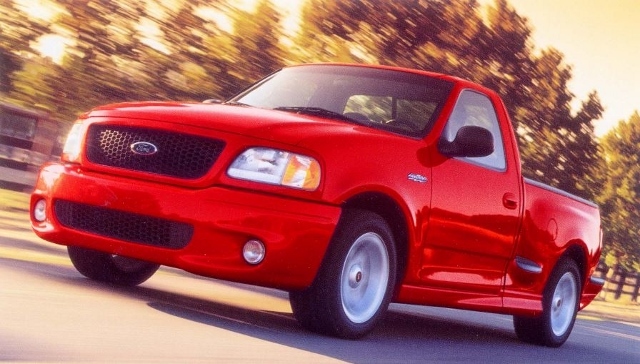 Ford equipped the Lightning with a 5.8-liter V8 packing 240hp and 340 lb-ft of torque. This power came mated to a 4-speed automatic overdrive transmission with auxiliary oil cooler. So, how did it fair against the competition? For their June 1993 issue, Motor Trend pitted the Lightning against the Silverado SS. At first glance, it appears the Lightning is at a disadvantage. The Silverado outguns the Lightning by 15 horsepower and a whopping 65 foot pounds of torque. In the dash from 0-60, it was a draw with both trucks reaching the mark in 7.2 seconds. In the quarter mile sprint, the Lightning beats the SS by 0.2 seconds. Not really that much faster but keep this in mind. The SS has a big block where the Lightning has a small block. Why Chevrolet only squeezed 255 horsepower from its 454 is anyone’s guess. 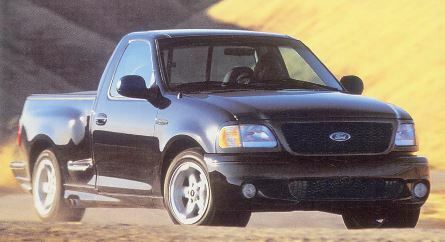 Ford continued producing the Lightning through the 1995 model year. At the time, it was the only high performance truck available since Chevy discontinued the Silverado SS 454 after the 1993 model run. It would be a four year wait until Lightning strikes again. What a difference four years makes. 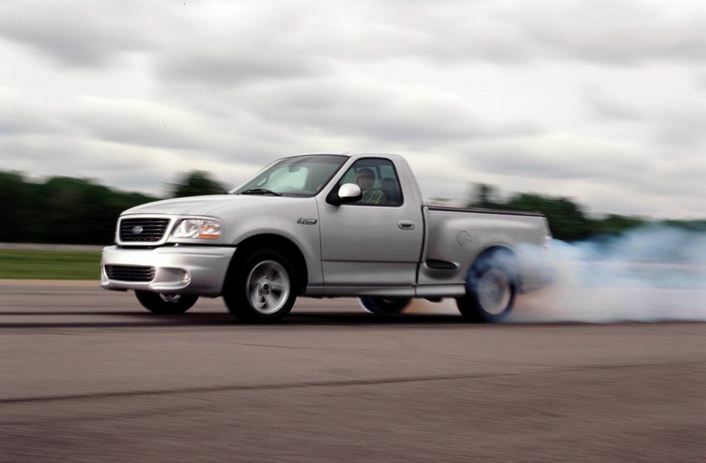 When Ford unleashed the Lightning in 1999, it was packing 360 horsepower and 440 foot pounds of torque. This time around, the Lightning employed a supercharged 5.4-liter Triton V8 coupled to a 4-speed automatic transmission. This twosome helped the second generation Lightning dash from 0-60 in 6.2 seconds. The Lightning could also ravage the quarter mile in 14.6 seconds topping out at 97 mph. 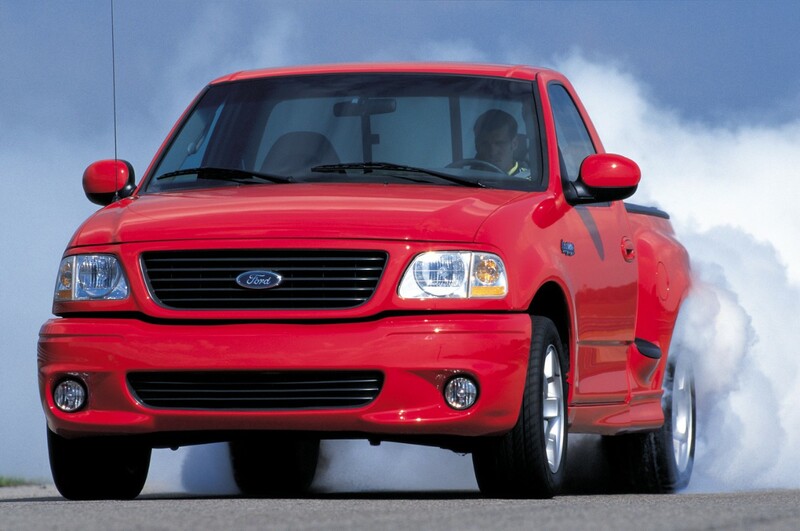 In its July 2004 issue, Truck Trend Magazine put the Lightning up against the new Dodge Ram SRT-10. Back in February, Dodge took away the Lightning’s world record title for fastest production truck. 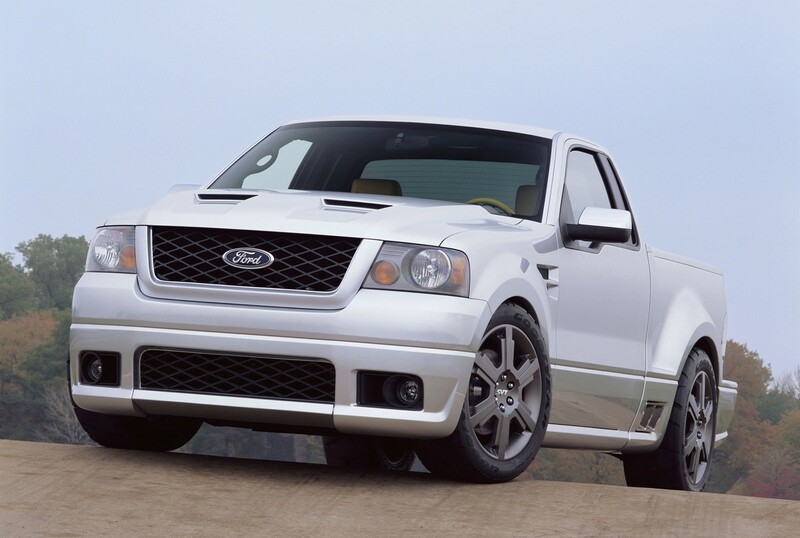 For 2004, the Lightning now packs 380 horsepower and 450 foot pounds of torque under the hood. Its rival has a 10-cylinder powerplant borrowed from the Viper tucked under the hood. The SRT-10 squeezes 500 horsepower and 525 foot pounds of torque out of its 8.3-liter engine and 6-speed transmission combo. At first glance, it appears the Lightning is at a disadvantage. In Truck Trend’s test, the Lightning is only 0.2 seconds slower from 0–60 and 0.3 seconds slower in the quarter. Not bad for a truck with two fewer cylinders and 120 less horses. When the Lightning was reintroduced in 1999, it moved away from the boxy appearance of its first generation. Just two years prior, Ford restyled the F-150 and gave it a more aerodynamic look. 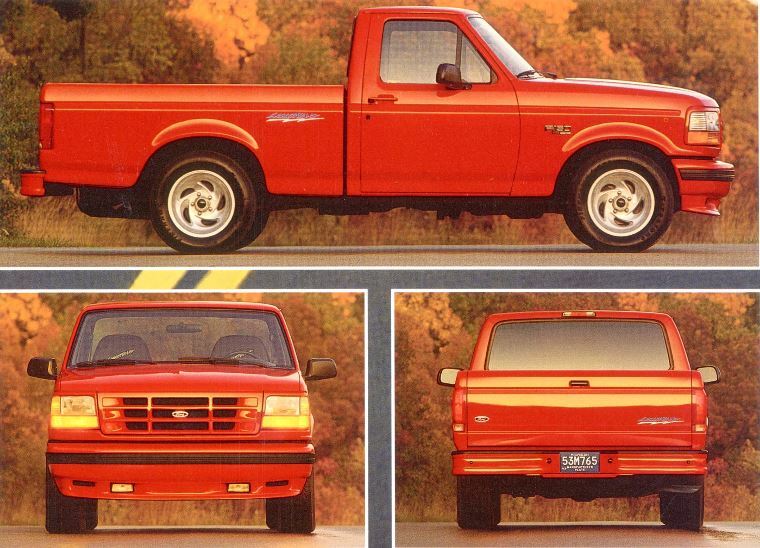 Just like before, Ford used a regular cab F-150 but moved to a stepside bed for the current Lightning. Dual exhaust tips were routed through the right side of the bed in front of the rear wheel. Bumpers, mirrors, and lower body extensions are body colored. Upper and lower grille, side steps, and rear bumper are accented in black. Five-spoke 18-inch wheels mounted to Goodyear Eagle F1 tires with front and rear stabilizers help the truck maneuver through the twists and turns. An optional tonneau cover was also available to keep the cargo secure and free from the elements. The 2004 Lightning was not cheap. Base price was around $32,600. The good news is this is about $12,000 cheaper than the SRT-10. Used Lightning prices range from $15,000 – $25,000, depending on condition. Ford ceased production of the Lightning after the 2004 model year. Could it have retaken its title as world’s fastest truck if production had been extended into 2005? Could Ford have possibly tweaked its engine and maybe squeezed out a few more horsepower? We can only guess at this point. The one ray of hope was in the form of the Lightning concept that was unveiled during the 2003 North American International Auto Show. The concept churned out 500 horsepower and 500 foot pounds of torque. The concept also featured a Tremec T-56 six-speed transmission. Now here’s where it gets interesting. Ford also gave the Lightning concept a little something extra under the hood. Ford’s patented SuperCooler intercooler provides extra power by using the truck’s air conditioning system to chill a small storage tank of coolant to around 30 degrees Fahrenheit. On demand, the system switches the intercooler flow from its normal circulation and empties the chilled coolant into the engine’s intercooler. By doing so, the intercooler dissipates up to 20 percent more heat from the charge air. The result is a denser air charge. The driver knows the system is ready when an indicator light on the dash turns green. From there, all the driver has to do to activate the system is to depress the accelerator to a wide-open throttle position. How great is that? Fast forward ten years and Ford has yet to create a new Lightning. Come to think of it, the Chevrolet Silverado SS and the Dodge SRT-10 have also come and gone. These days, it seems the Big Three are concentrating more on the pony car wars and less on high performance trucks. That’s not necessarily a bad thing. But for those who really want a sport truck, you really have two choices. Find a good used one or wait around for another wave of sport trucks to hit the market. With no news on anything new, the wait looks to be a long one.